Lions Gate Bridge travellers may have had a bumpy ride during last year’s rehabilitation work that required us to use a temporary road plate while replacing a bridge deck joint. It’s time again to do some more rehab work; but please don’t worry – we have a smooth solution. In order to avoid traffic delays like the ones that happened last year, we’ve developed a comprehensive “bump-free” plan to keep traffic moving smoothly while we replace the expansion joint on the south tower in early April 2016. The plan involves installing a temporary bridge cover and two 13-metre approach ramps on either side, which is nearly double the length of the previous approaches. This time, there will be one long transition zone with no steps, versus last year’s series of plates layered on top of each other. The longer ramps will allow a gradual approach both on and off the temporary cover, ensuring the drive is smooth for everyone – no matter if you’re driving a car, truck, or motorcycle – and without the need to slow down. That’s good news for the approximately 65,000 vehicles crossing the bridge each day. The cover will span the gap that will be open during the repair, allowing enough space beneath the bridge deck for crews to work safely. The rehab work needs to be done because the expansion joint has exceeded its design life. That means parts of the existing joint must be removed and replaced with new parts. Crews will install a temporary cover and approach ramps on April 2 and 3, and the bridge repairs will take about eight weeks. Expect delays crossing the Lions Gate Bridge during the two-day (12-hour) installation period April 2 and 3 (weather dependent). There will be a single-lane closure 9 pm – 10:30 pm on April 2, then single lane alternating traffic from 10:30 pm April 2 to 9 am April 3. It’s a good idea to consider an alternate route during this period. We’re working with our partners, including TransLink and West Vancouver Blue Bus, to ensure that everyone is looped in on the work plans. If you have a question about the new ramp or bridge work, feel free to ask us below. Glad to hear you liked it Nick! People cycling over the bridge still have to endure serious bumps. Also, the sharp ramps adjacent to the towers are also a safety hazard. Recently someone had a bad fall as a result and endured multiple abrasions and a broken leg. Apparently the person was a tourist and not familiar with the bridge. When will these safety hazards for those cycling over the bridge be addressed? Hello Arlo – thanks for sharing your concern with us here. We have sent your comment to our local area manager for review and follow-up. Our area manager has let us know that he will have our bridge area manager go review the ramps near towers. If changes are required, he will put this project forward for future funding to make changes to the ramps. As the bridge sidewalk is a multi-use pathway used by cyclists and pedestrians he also asked us to remind cyclists to ride with due care and attention, and at a rate of speed not in excess of the posted speed limit. Thanks again for your comment – we hope that this helps. Any chance you could build a similar gradual bump for cyclists? The current and sudden 30 degree ramp is a safety risk – especially when on the downhill route. It’s knocked lights and panniers off my bike before, and knocked me off balance – and I’m a young and experienced on- and off-road cyclist. Elderly users or anyone passing when they hit that bump could be facing a serious hazard. Thanks! Thanks for your comment. We have shared it forward with the local area manager for review. We have asked our Bridge Area manager to review the bump, to see if the grades can be lessened to improve the rideability for cyclists. I remember that big bump or kink before the major retrofit. I am glad it’s gone. The lions gate bridge south bound is always super busy from 4pm to 6pm from the upper highway. When north bound is running smoothly, one more lane should be opened for south bound. Doesn’t anyone monitor the bridge? Thank you for connecting with us here and sharing your concern regarding morning & afternoon counterflow changes at the Lions Gate Bridge and Stanley Park Causeway. 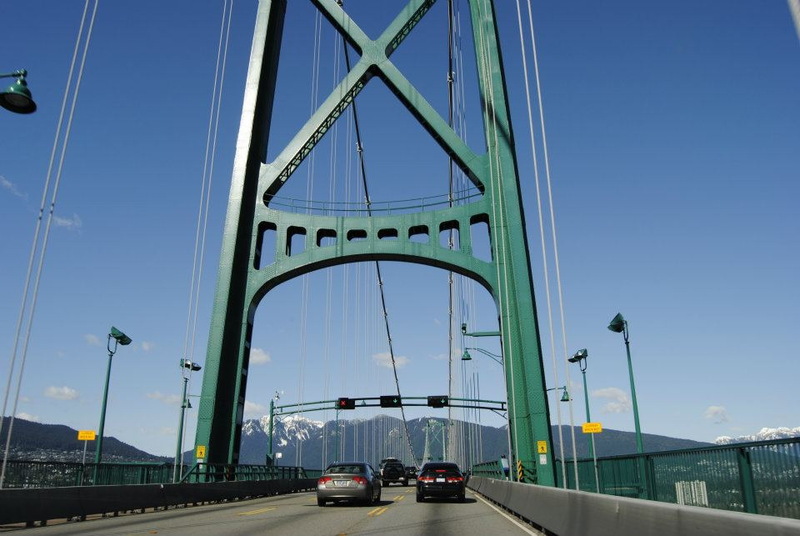 In July 2013, the Ministry of Transportation and Infrastructure enhanced its ability to manage the counterflow operations of the Lions Gate Bridge and Stanley Park Causeway. As noted on our counterflow webpage (http://www.th.gov.bc.ca/drivebc_supp/counterflow.htm), the timing of morning and afternoon counterflows have been looked upon as targets only, and that the “timing varies at the operators’ discretion, based on traffic demand, visibility and weather conditions”. Enhancements included the addition of new cameras and system capabilities to more accurately monitor the traffic volumes travelling on either end of the Lions Gate Bridge especially during the peak periods. This level of enhanced monitoring has resulted in our operators’ to more accurately forecast queuing limits and make more dynamic changes to the counterflow systems outside of the scheduled periods. Typically this has resulted in 2-5 changes between 3 – 7 pm to primarily help relieve some of the southbound congestion into Downtown Vancouver. When a counterflow change has been implemented, the traffic flow is continually monitored to ensure the impact to northbound traffic is of relatively short duration. The result is that through active monitoring, we are able to clear congestion on either end more quickly before extensive queues develop. We have received positive feedback and continued support from all of the North Shore municipalities for this initiative. I hope that this helps to explain our intent. No part of the process is automated and our operators continuously monitor the conditions and congestion, and make every effort to manage the traffic to help ensure the smallest impact on the greatest number of commuters. Please don’t hesitate to contact Steve Rehbein at 604-527-2113 should you have any other questions. Will the bridge be open early morning 5-7 on April 5? Hi Ruth, I’m happy to report that installation of the ramp has been completed and there are no closures related to construction expected. The temporary bridge cover and two 13-metre approach ramps will keep the drive smooth, so that traffic flow will remain efficient and delays are minimized.